One of the things I do love about the UAE is that the weather is never too bad to hit the pool. And if pools aren't enough, there are always beaches and water parks! 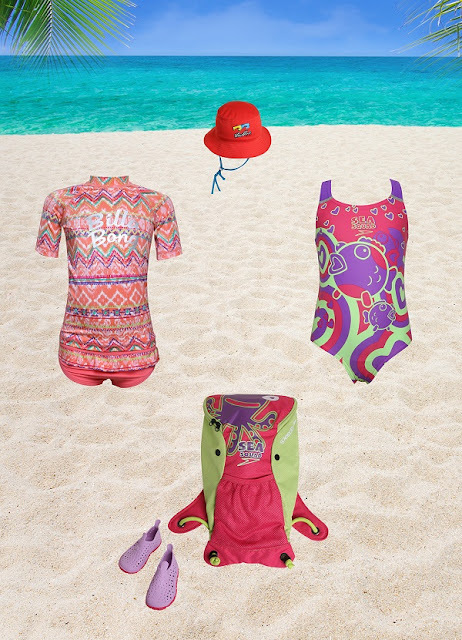 And to make these visits safe and fun for kids, you need to have the right swimwear and gear. Little Dude, like most kids, loves the water. If he's in the pool, it's hard to get him out. So, when we tried out the new range of Speedo Juniors swimwear from Stadium, we weren't short of opportunities to use them! Stadium is a sports and fitness store with over 48 well-known brands. Speedo, of course, is a trusted name in swimwear, and they have a great collection for kids and teens. For the younger ones, they have the Speedo Sea Squad range. 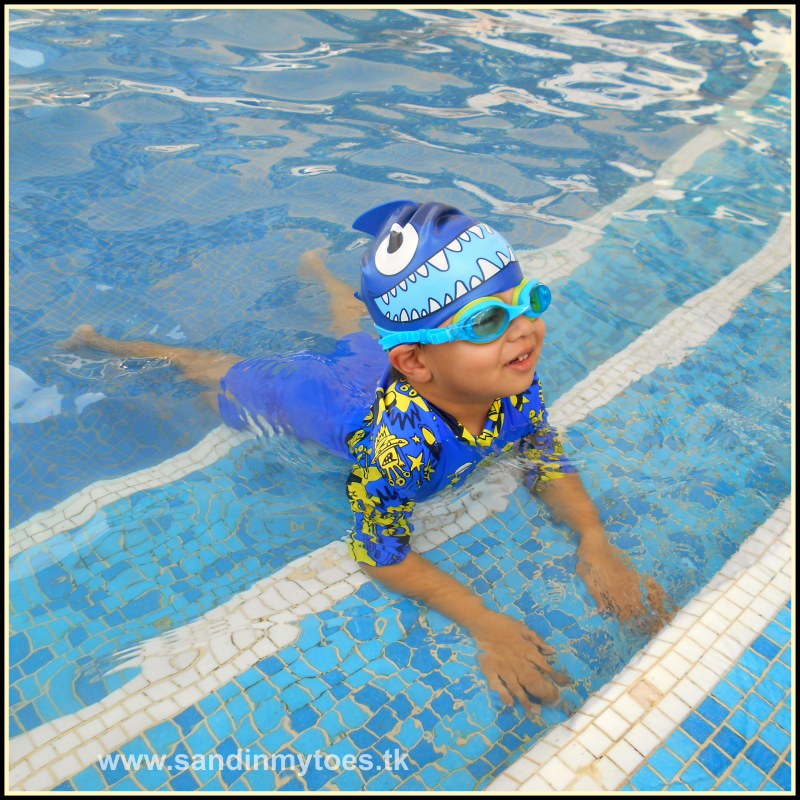 This All In One Swimsuit (AED 165) is good for toddlers who are learning to swim, because it is fuss-free. It's easy to get on, and also to remove when wet. The fabric dries quickly, and is also stretchy so that it allows movement for energetic little ones. The best quality of this swimsuit is that it offers a sun protection factor of 50+ from UVA and UVB rays. That's something we really need to care about here in this country. We loved the outer space themed style of this swimsuit, and Little Dude was very comfortable in it. The fabric is so smooth that water just glides off it, and it doesn't cling too much. 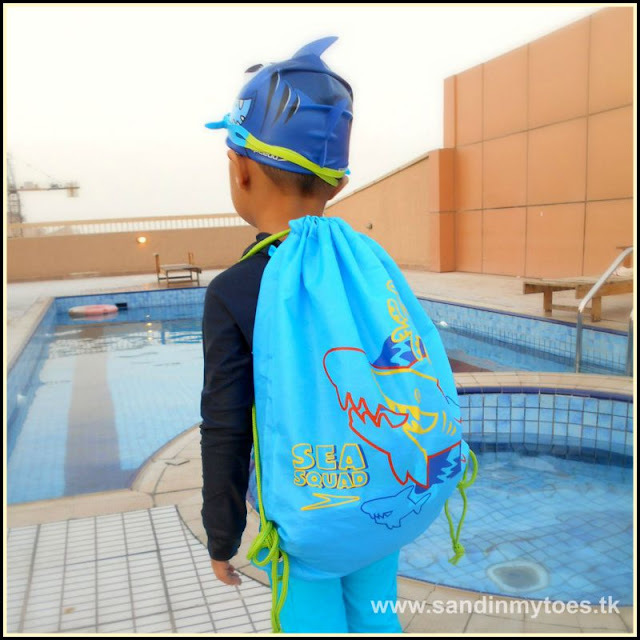 We also liked the Shark Swim Cap and Junior goggles which come with the Swim Bag Set (AED 95). The set includes the swim cap, swimming goggles, and bag. There's also a pink/yellow version you can find at the store. The Shark Swim Cap not only looks cool, it functions well in keeping the water out. The silicone material is stretchable, and will fit perfectly after a few wears. It's another great accessory for swimming. The Junior Goggles have a comfortable silicone strap that can be adjusted to fit easily. I like how there's a little tint in them which is a good feature when swimming under the sun. They also feature anti-fog coated lens, so you won't have to worry about drying them often. The Swim Bag that comes with this set is handy to carry to the pool or beach. It has adjustable drawstrings, and will keep splashing water out. If you have a water-loving tot, this swim set is essential, especially if they are learning to swim. The swimsuit Little Dude is wearing in the above photo is the All In One Sun Protection Suit (AED 195). 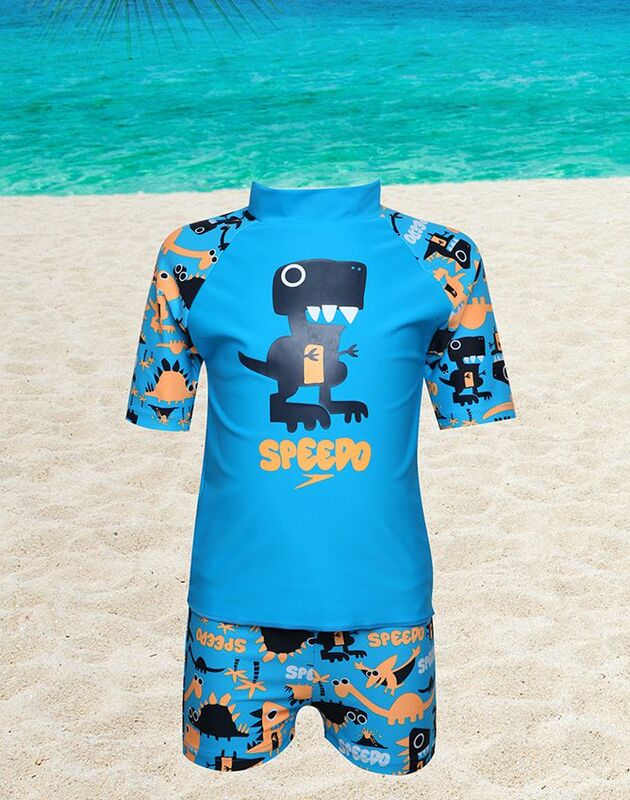 Now, most kids would be happy spending time in their swimming trunks, but if you are out in the sun for a long time, you should consider getting them a sun protection suit like this one. This swimsuit covers the whole body, and yet, is made with a light fabric that even Little Dude didn't mind wearing. It has a UPF (ultraviolet protection factor) of 50+, so it's quite good for keeping safe in the sun. You still have to use sunscreen on exposed areas, but isn't it great that you have less sunscreen to apply on a squirmy toddler? I know we'll be using this one every time we're swimming in the sun. The Dino motif made it very likable to Little Dude, and this is a kid who is happiest in shorts! Foe heading to the beach, I recommend this Swim Top (AED 150), which we paired with these Sea Squad Leisure Shorts (AED 65). The top also offers sun protection, and is made from similar material as the All In One Swimsuit. The fabric is stretchy, light, and comfortable for playing in and splashing around. I chose the shorts for lounging on the beach. They are made with a quick-drying fabric with mesh lining, so they don't cling. There's an elastic waistband, so you don't have to worry about cords getting in the way. You can also buy the matching set of swim top and trunks below for AED 225, available at Stadium stores. 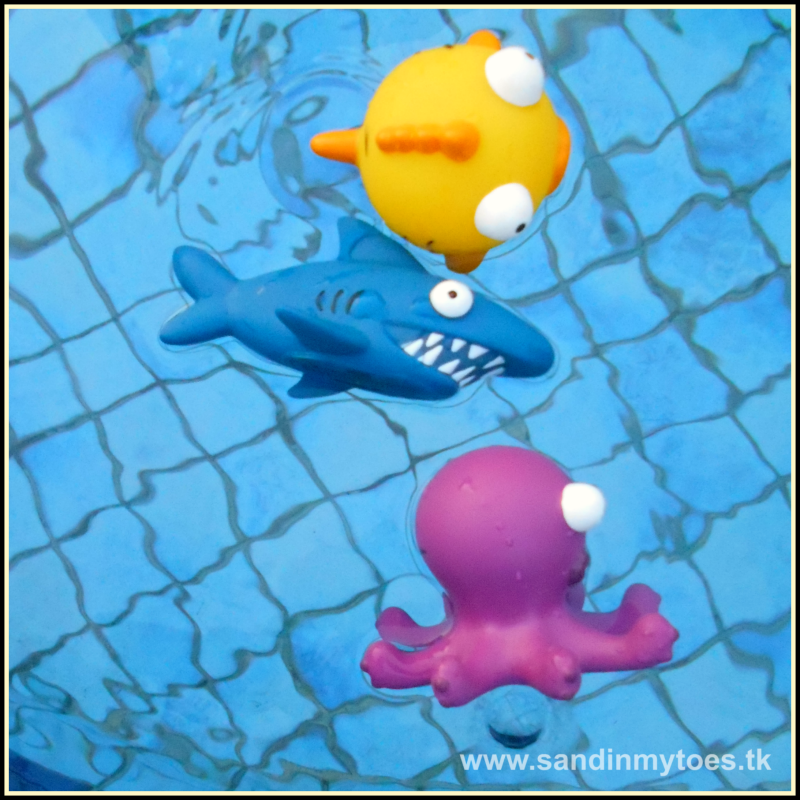 And to make pool or bath time fun, you can take along these Swim Squad Toys (AED 50) based on the Speedo Swim Squad characters. Stadium also stocks Speedo Floatsuits, and swimming aids for kids. Visit any of the eight Stadium stores in the UAE to find these items and more. Check their Facebook page for more details. For details on Speedo swimwear for kids, visit their website. We received these products for the purpose of review, but all views and opinions are my own.